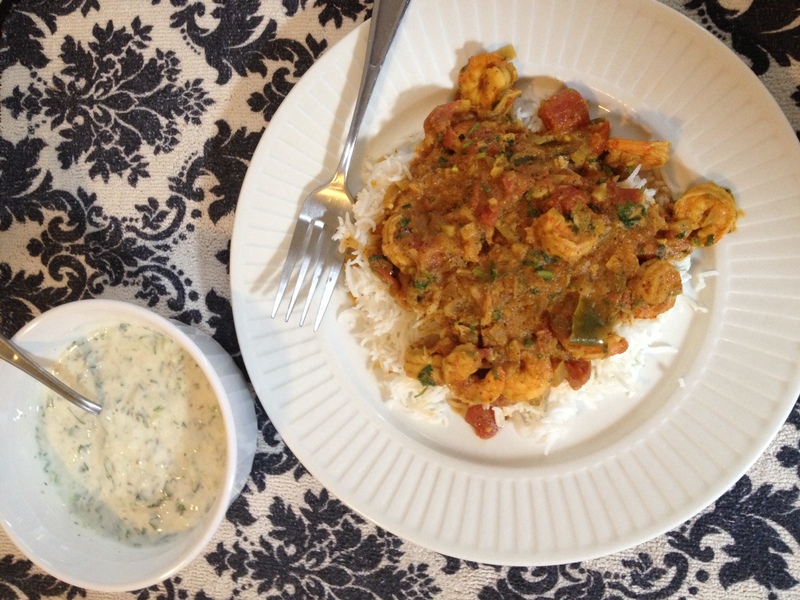 My sister Audrey offered to make this tangy, creamy, yummy, coconutty (if it’s not a word, it should be) shrimp curry. She says it’s super easy. Funny. It doesn’t taste it. Forget takeout. If you make it for your friends and family they’ll think you’re a Bollywood superstar, who can cook. It was just for grownups, but my 2-year-old niece Sophie ate quite a bit and insists that it isn’t spicy. The part that floored me was the amount of coriander she used…about 1/2 a cup chopped….but it didn’t overpower it. It just made the end product brighter. If you don’t like coriander just leave it out, but it kind of makes the dish. I know it’s one of those flavours you either love or loathe. I hated it as a child, but love it now. Like I said it just blends into the overall deliciousness. So live a little. And you can leave out the two green chillies if you can’t eat as hot as a two-year-old. In a mortar and pestle grind mustard seeds and cardamon until fine. In a medium-sized pot on medium heat add olive oil and saute onions until soft. Add green chillies and fry for 1 to 2 minutes, then add garlic and ginger. Fry and cook and until fragrant. Add ground spices and fry until oil comes to the top or separates. You can add a tablespoon of water if it sticks. This is an important step so don’t rush it. Frying the spices intensifies the flavour. Add diced tomatoes and cook until thickened. Add shrimp and cook for no more than 10 minutes. In last five minutes add chopped coriander and creamed coconut. Taste the curry after shrimps are cooked. If it’s too spicy you can add more creamed coconut. This entry was posted in Savoury and tagged Chili pepper, Coconut, Coriander, Garlic, Goan, Olive oil, Shrimp, Spicy. Bookmark the permalink.